Draft: 2012, Baltimore Orioles, 19th rd. Became engaged this past November... his fiancée's name is Maria... Graduated from Old Mill (MD) Senior High School...Enjoys hunting, fishing, clay shooting and photography. Went 6-1 with a 2.43 ERA and 12 saves in 55 relief appearances with Milwaukee... Made his first career Opening Day roster... Was an All-Star for the first time... Was named National League Reliever of the Year... Was named Brewers Most Valuable Pitcher as voted on by members of the Milwaukee Chapter of the Baseball Writers Association of America... Finished seventh in National League Cy Young Award voting... Led Major League relievers with 143 strikeouts in just 81.1 innings (15.82k / 9ip)... Had the most strikeouts in Major League history by a left-handed reliever in a single season and tied for eighth overall all time among relief pitchers in a season... Broke the franchise record for strikeouts by a reliever in a single season, passing Corey Knebel, who had 126 strikeouts in 2017... Notched 16 consecutive outs via strikeout from 9/10-9/21, the most in the Expansion Era... His .132 opponent batting average ranked second among qualifying Major League relievers, trailing only the Rangers' José Leclerc (.126)... Made 23 appearances of at least 2.0 innings...the team went 23-0 in those outings... Produced 7 saves of 2.0+ innings... Earned his first Major League save on 4/14 at New York-NL... Was 12-for-17 in save opportunities (70.6%)... 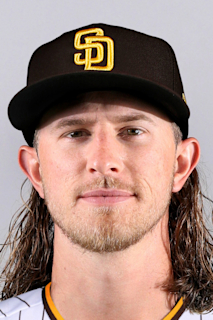 Retired 43 of 55 first batters faced (78.2%)... Stranded 17 of 23 inherited runners (73.9%)... Named National League Reliever of the Month and Brewers Pitcher of the Month for March/April after posting a 1.00 ERA in 11 games (4sv, 18ip, 4h, 3r, 2er, 5bb, 39k, .070ba)... Notched the save in the NL Central tie-breaker game on 10/1 at Chicago... Made 7 scoreless appearances during the postseason (10ip, 5h, 1bb, 16k, .152ba). Went 3-8 with a 3.29 ERA in 25 starts between Double-A Biloxi and Triple-A Colorado Springs...Held opponents to a .223 batting average with 161 strikeouts in 126.0 innings• Began the season at Double-A Biloxi, where he went 2-1 with a 0.95 ERA in 11 starts while holding opponents to a .194 batting average with 73 strikeouts in 57.0 innings ...Was a Southern League All-Star...Pitched in the All-Star Futures Game at Petco Park (0.1ip, 1k)...Was promoted to Triple-A Colorado Springs on 6/11 and went 1-7 with a 5.22 ERA in 14 starts while opponents batted .245 with 88 strikeouts in 69.0 innings ...Was added to the 40-man roster on 11/18...Enters 2017 as the second-best prospect in the organization according to Baseball America. June 9, 2017 Milwaukee Brewers recalled LHP Josh Hader from Colorado Springs Sky Sox. March 13, 2017 Milwaukee Brewers optioned LHP Josh Hader to Colorado Springs Sky Sox. November 18, 2016 Milwaukee Brewers selected the contract of Josh Hader from Colorado Springs Sky Sox. July 17, 2016 Colorado Springs Sky Sox activated LHP Josh Hader from the temporarily inactive list. July 9, 2016 Colorado Springs Sky Sox placed LHP Josh Hader on the temporarily inactive list. June 11, 2016 LHP Josh Hader assigned to Colorado Springs Sky Sox from Biloxi Shuckers. June 6, 2016 LHP Josh Hader assigned to Biloxi Shuckers from Helena Brewers. June 2, 2016 LHP Josh Hader assigned to Helena Brewers from Biloxi Shuckers. January 26, 2016 Milwaukee Brewers invited non-roster LHP Josh Hader to spring training. August 2, 2015 LHP Josh Hader assigned to Biloxi Shuckers. July 26, 2015 Corpus Christi Hooks activated LHP Josh Hader from the temporarily inactive list. July 5, 2015 Corpus Christi Hooks placed LHP Josh Hader on the temporarily inactive list. March 9, 2015 LHP Josh Hader assigned to Houston Astros. August 4, 2014 LHP Josh Hader assigned to Corpus Christi Hooks from Lancaster JetHawks. May 24, 2014 Lancaster JetHawks activated LHP Josh Hader from the temporarily inactive list. May 20, 2014 Lancaster JetHawks placed LHP Josh Hader on the temporarily inactive list. April 2, 2014 LHP Josh Hader assigned to Lancaster JetHawks from Quad Cities River Bandits. August 2, 2013 LHP Josh Hader assigned to Quad Cities River Bandits. March 31, 2013 LHP Josh Hader assigned to Delmarva Shorebirds from Aberdeen IronBirds. August 20, 2012 Josh Hader assigned to Aberdeen IronBirds from GCL Orioles. June 27, 2012 Josh Hader assigned to GCL Orioles from Baltimore Orioles. June 21, 2012 Baltimore Orioles signed Josh Hader.